Our select team of asset allocation specialists remains focused on providing the highest level of personal client service, while managing global multi-asset class portfolios for optimum long-term results. Streamlined and consistent in philosophy and process, we are an SEC registered investment advisor with offices in Buffalo, NY, and Palm Beach Gardens, FL, that manage and advise on over $1.1 billion in assets for individuals and institutions. 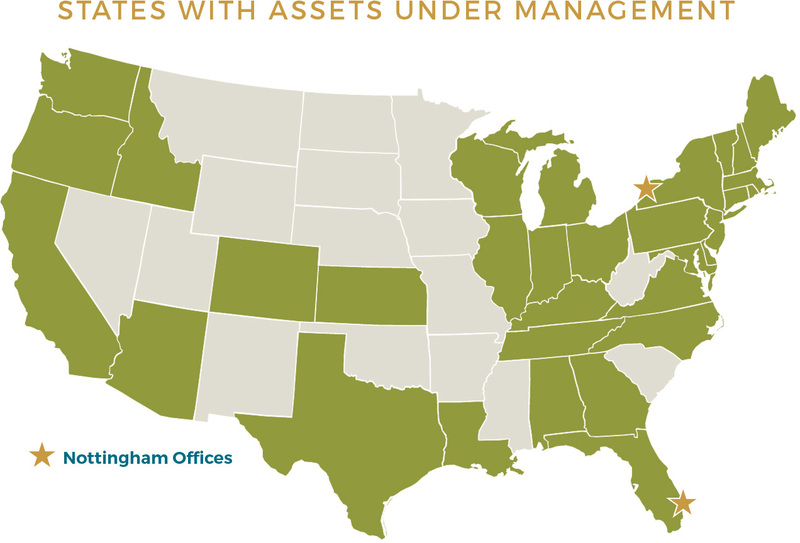 The firm has a national presence with clients in more than 30 states. Nottingham understands that investment management shouldn’t be “one size fits all” and the firm tailors each solution to fit the specific needs of each client regardless of account type. The firm was founded in Buffalo, New York in 1981 as an SEC registered investment advisor specializing in separately managed accounts. Throughout the 1980’s and 1990’s, the firm implemented its strategies using individual large capitalization growth stocks. The turn of the century brought some exciting changes as the firm was acquired in 2000 by Community Bank Systems, a publicly traded company (NYSE: CBU) based in Dewitt, New York. Additionally, in order to broaden the scope of its investment management services, the firm began to incorporate exchange traded funds (ETFs) into portfolios in 2001. By 2006, the firm had completed its transition away from individual equity positions and was managing fully diversified, index based portfolios. That year, the firm was also rebranded as Nottingham Advisors and a second satellite office was opened in North Palm Beach, Florida. 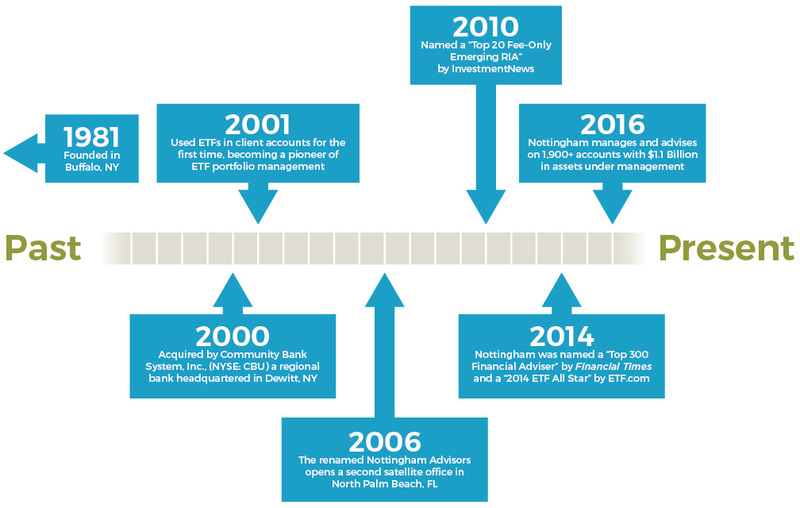 Building off its position as an early adopter of exchange traded funds, the firm continues to have a large role in the ETF Investment Strategist (EIS) landscape.